Terrace Ridge is a gated resort close to Disney. This lovely condo is on the top floor, with elevator access and views of the pool! THe living, dining and kitchen areas are open, with lots of natural light and high ceilings. The living room has a big flat screen tv and there is free wifi in the unit. THe dining table seats 4, plus there is a breakfast nook that seats 2 more. 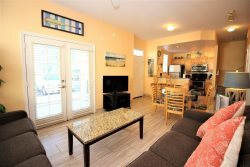 The kitchen is fully equipped with large and small appliances and there is a full size washer and dryer in the unit. Off the dining area, there is a screened in balcony that overlooks the pool area. There are 3 big bedrooms and 2 full bathrooms. The master bedroom has a king size bed, a tv, and a full attached bathroom. The second bedroom has a queen bed with a tv. The final bedroom has 2 twin beds and a tv. These bedrooms share a hall bath. Terrace ridge has a clubhouse with an exercise room, a games room and a social gathering room. The pool is huge, with lots of seating and lounge chairs. There is also a sand volleyball court. The resort has lots of parking and is completely gated. There is a shopping area, including a grocery store,pharmacy and restaurants very close by. Angela was awesome. She was so helpful and friendly as if we knew each other for years and I only talked to her on the phone.